Welcome to Genius Babies! Smart Baby Toys & Gifts. ~ Unique newborn baby toys & gifts, baby shower gifts, welcome new baby gifts and toys, smart baby's 1st first birthday gifts. Shop for educational, award winning baby & toddler toys. Looking for the best baby gifts? ~ Baby e-Gift Certificates always fit! Encourage the genius within every baby! Genius Babies is a baby boutique that specializes in unique baby gifts, baby shower presents, and educational baby toys. We offer the highest quality developmental toys and gifts for babies, infants, and toddlers. Educational toys help stimulate young minds and develop skills, and we offer a great selection of Infant stimulation toys, toddler and preschool toys, baby books, child-size musical instruments, and lots more. If you are unsure what to choose, a Genius Babies gift certificate or a baby gift basket of many educational toys for a baby or young child is always a perfect fit. Out of the many online baby boutiques, Genius Babies is geared toward toys to enrich your new baby�s or child�s learning skills while still being fun. For infants, toddlers, and preschool children, we carry many toys that stimulate curiosity and allow your children to develop all the necessary skills. Educational baby toys range from black, white, and red colored balls, mobiles, and rattles designed for an infant to musical toys for toddlers that play different sounds, as well as classical music. Educational toys aren�t always about being introduced to new concepts, however, and include toys geared toward developing social and creative skills in your child. From soft toy blocks designed for a baby to play sets and arts and crafts kits for children about to start kindergarten, our selection of educational toys includes many games and activities for learning social skills and for developing creativity. Toys geared toward infants differ from those geared toward toddlers, but Genius Babies� selection caters to both developmental stages. Infant toys are designed to stimulate the five senses of a new baby, especially as his or her senses start to develop and your new baby becomes more aware of his or her surroundings. A typical educational infant toy is black and white or has bold colors, but Genius Babies, with our own store brand and with the other brands we carry, combines these two visual concepts, and we have a wide variety of infant toys that are in black, white, and red and come in bold patterns involving these colors. For developing other senses, particularly touch and hearing during the first six months, an infant toy can have many different textures and can make many different sounds when touched. A toddler toy, on the other hand, expands upon these skills and has another developmental purpose. As a child over one year finds his or her new physical abilities like crawling, walking, running, and jumping, many toddler toys are designed to enhance these skills. But, as a toddler is gradually getting ready for preschool, a toddler developmental toy can have a purpose other than physical skills. Educational toddler toys, even those as simple as a matching game or building blocks, have a developmental purpose, such as learning logic, reasoning, hand-eye coordination, and social skills like taking turns and following directions. Aside from baby toys, Genius Babies has a wide variety of baby gifts for occasions like a baby shower or a first birthday. If you are searching for a unique baby gift for a baby shower, our store has many options, from personalized learning gift baskets to traditional gift baskets that include bibs, towels, and a blanket. A baby gift basket or unique gift set by Genius Babies has many necessary learning and developmental toys a baby will need in the first six months. Our gift baskets, one of which comes in a red wagon, have various combinations of black, red, and white stimulation items like rattles, toys, and baby books. For a baby shower, aside from a gift for the new baby or parents, an older child might feel left out or is now getting used to the fact he or she will be a new older sibling. For this occasion, Genius Babies has many big brother and big sister gifts, including t-shirts and books about being a new big brother or sister to the new baby. Need a new baby gift shipped FAST? Our customer care team will ship your gifts within one business day as your order is placed. We will provide a complimentary gift card and a large selection of premium gift wrapping is available to make your gift presentation perfect. Too many great selections to chose just one? Short on time? 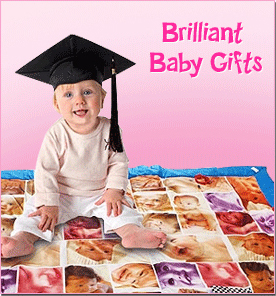 Select a Genius Babies Baby e-Gift Certificate and let the parents chose what they like best. You can trust Genius Babies to give a personal touch to all of your special baby gift giving needs.